Perfect for beginner drummers with style and sound that works for more experienced players too. Since Crush Drums introduced The Alpha series, many drummers have put this kit in use as a secondary gig kit for smaller stages. 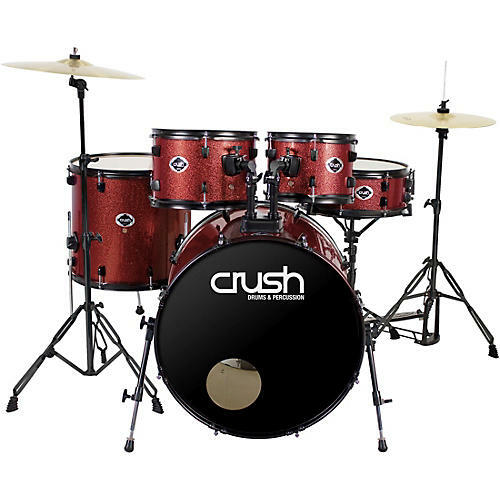 The Crush Alpha series offers superior sonic tone and performance compared to similarly priced drum sets. The way Crush does this is by offering a premium Birch/ Basswood Hybrid shell complete with beefed up tom holders, brackets, snare throw off and spurs. Every aspect of the Crush Alpha kit has been designed and built with strict attention to detail, design, and sound quality. The Alpha Series comes complete with drums, hardware, cymbals, a ported bass drum front logo head, six pairs of drums sticks and a premium Crush stick bag. Everything needed to set up and play! The Crush Alpha Series is available in Midnight Blue Sparkle Flake and Wine Red Sparkle Flake. Bass drum(s): 22 x 18"
Tom(s): 10 x 7, 12 x 8"
Floor tom : 16 x 15"